Oh, if only I had a nickel for every time someone used skewed or half-truth statistics to push the lie that is breed-specific legislation (BSL). For instance, last week, Pawtucket, Rhode Island, in a desperate bid to keep their city-wide “pit bull” ban, released statistics showing that the city of Pawtucket supposedly had a marked reduction in dog bites from so-called “pit bulls” since passing their “pit bull” ban in 2004. What they didn’t tell the public was that the reduction in so-called “pit bull” bites followed an overall trend in the reduction of crime in Pawtucket. For instance, violent crime in Pawtucket was, and to some extent still is, a problem. 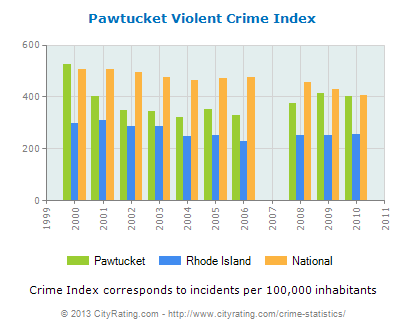 As you can see from the graph below, Pawtucket’s violent crime rate was higher than Rhode Island’s overall, and during some years, neck-and-neck with the national average. Pawtucket crime statistics report an overall downward trend in crime based on data from 11 years with violent crime decreasing and property crime decreasing. “Pawtucket has witnessed a substantial drop in attacks by pit bulls since the city ban. Before that, Pawtucket experienced significant problems, sometimes associated with people involved in criminal activity, with pit bulls that had been trained to become vicious, or with people who were indiscriminate pit bull breeders,” he said. Therefore, 1) the ACO admits the problem was crime, not “pit bulls.” 2) He acknowledges that the “pit bull” “breed” is not inherently vicious, but that criminals train so-called “pit bulls” to be vicious, which often happens when drug dealers and other criminals train dogs of any breed to protect their drug houses, etc. 3) Because the problem was really crime and not so-called “pit bulls,” Pawtucket has unjustly adversely affected law-abiding “pit bull” owners. So because Winnipeg cracked down on the dogs instead of the criminals exploiting the dogs, dog bites in Winnipeg rose despite the ban because criminals simply switched to other breeds. It makes me wonder if Pawtucket has experienced an increase in dog bites from other breeds besides what they are calling “pit bulls” since their ban was put in place. That has certainly been the case in Denver and Miami-Dade County. Pawtucket did do one thing right. They didn’t pass a “pit bull” ban thinking it would reduce crime; they cracked down on the actual crime and the dogs sadly went with it. As you can see from Pawtucket’s Animal Control officer — who unintentionally admitted that Pawtucket had and has a crime problem, not a “pit bull” problem — it is the criminals that train “pit bulls” to engage in what we would consider bad behavior. Dogs don’t know right from wrong; it is up to their owners to train them in proper behavior. The fact that criminals can train dogs to do bad things doesn’t make the dogs bad or the “breed” bad, which Pawtucket’s ACO has also unintentionally admitted. 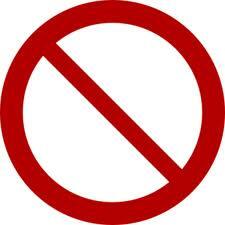 Despite Pawtucket’s “pit bull” ban, we see from Pawtucket’s “pit bull” stats that BSL did not prevent attacks. (However, scratches and attacks on other animals should be separated out for clarity sake. But then, the label “pit bull” itself is unclear and can incorporate so many breeds, mixes, and lookalikes, which is why Pawtucket’s statistics are likely to be skewed.) In addition to cracking down on crime, had Pawtucket put more emphasis on a dangerous dog (owner) law instead of BSL, perhaps those attacks could have been altogether avoided. Similarly, if you look at cities like Denver, Toledo (including nearby Swanton, Ohio), and Cincinnati, you see that there has been a huge problem with breed identification such that Animal Control officers and dog wardens spend more time trying to figure out, usually unsuccessfully, if a dog is a “pit bull” as defined by their own ordinance, that other potentially problematic dogs and dog owners, slip through the cracks. That’s why you’ll see BSL cities like Denver and the county of Miami-Dade with increased dog bite stats: They attempt to enforce BSL to the exclusion of other problematic dogs and dog owners. I’ve just illustrated many ways in which dog bite stats can be manipulated. So, here’s a thought Pawtucket: If you have to mislead the public with skewed, half-truth statistics in order to maintain your “pit bull” ban, is your cause really that just? Moreover, to try to maintain that Pawtucket’s “pit bull” ban is what supposedly reduced “pit bull” dog bite stats instead of saying it was the reduction in overall crime that reduced “pit bull” dog bite incidences, is to disrespect the work that law enforcement did and does to significantly reduce crime in Pawtucket.